Ethan of Athos is one of the few books set in Lois McMaster Bujold’s universe of Miles Vorkosigan that does not feature an appearance by Miles or any member of his family. The story begins on Athos - a planet populated solely by males, because they banned females generations ago. The men of Athos reproduce by importing ovaries and cultivating babies in birth chambers. Dr. Ethan Urquhart examines a new shipment of ovaries and discovers that they are useless - some damaged and some from animals. Much to Ethan's chagrin, the Athos government assigns him to travel off planet and find out what happened to their original shipment. This distresses Ethan, who has been conditioned all his life to be repulsed at the thought of women. Of course, Ethan finds himself the target of a murder attempt and he is rescued by a female assassin - Elli Quinn. Together, Ethan and Quinn track down the reason the shipment was stolen and replaced. The story has action and intrigue, but also some messages about culture. Athos holds deep prejudices against women; and others in the galaxy hold prejudices against Athos for their homosexual lifestyles. To succeed, Ethan must overcome his prejudices and work with Quinn. While not one of Bujold's best novels, I still enjoyed Ethan of Athos. Mile Vorkosigan and his cousin Ivan of the Barrayar Empire attends the funeral of the empress of the rival Cetagandan Empire. Shortly after landing, they are attacked by a Cetagandan servant and wrestle away a mysterious artifact. When the servant turns up dead shortly afterward, Miles and Ivan must figure out who is behind the murder, the theft of the artifact, why is the artifact so valuable, and the political plot they ultimately uncover. 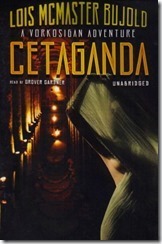 Like all of Lois McMaster Bujold's novels, Cetaganda" combines action, political intrigue, and character development. This one is primarily a detective story with Miles and Ivan uncovering clues that help them uncover the answers to the questions above. This novel introduces the Cetagandans and provides details about their culture. It was written later than other stories that feature this race/empire and I'm told it helps to better understand their motivations. Bujold has a talent for building rich characters and adding layers in each novel. In this story, we get a deeper look inside the mind of the carefree, womanizing Ivan and see the reaction of Miles, who is less smooth and less attractive due to his diminished size and birth defects. It's easy to cheer for Miles the underdog, despite the privileges being born to royalty. Miles Vorkosigan is young and intelligent, but deformed and undersized, thanks to a failed assassination attempt on his mother a few months before his birth. He has the added pressure of being the son of the legendary Lord Admiral Aral Vorkosigan - one of the great military strategists of the Barrayaran Empire. The Vor Game advances the story of young Miles, who is an unlikely hero, thanks to his physical handicaps. Bujold establishes Miles's issues with following authority, which gets him into trouble; but also with his headstrong ways, which sometimes gets him out of trouble. We also get our first look into what makes Emperor Gregor tick. Bujold does a very good job of mixing action, political intrigue, and character development into her stories. There are a few too many coincidences, as Miles keeps running into people from his past while at the far edge of the galaxy; but one can forgive this because the story is engaging, and the coincidences help to move it forward. Shea Ohmsford was living a quiet life, running a farm with his brother Flick. Shea knew he was adopted, but when the tall stranger Allanon shows up, he learns that he is half-elf and the last living member of the legendary Shannara family. Allanon convinces the brother that their land is danger from The Warlock Lord - an evil wizard, who seeks the power of the legendary sword of Shannara; so, the three of them set out on a quest to find the sword. Along the way, they are joined by men and elves and attacked by gnomes, trolls, and black flying monsters known as "skull bearers". They are separated during their journey, but continue their mission to thwart the Warlock Lord. 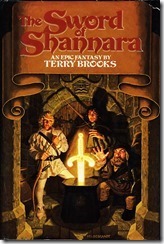 This is the story of The Sword of Shannara by Terry Brooks. If it sounds familiar, it is because Brooks acknowledges J.R.R. Tolkien as one of his influences. Comparison's with the Lord of the Rings are inevitable: A disparate group, consisting of men, elves, and dwarves travel across a mystical land to seek a powerful magic relic, preventing the evil wizard from acquiring it first. There is even a crazy gnome with a startling resemblance to Gollum. If you can get past Brooks's obvious "inspiration" for his plot, he does tell a pretty good story. The narrative is more traditional than Tolkien's and more appropriate for the simpler story. I enjoyed it. This week, I went to The Church on Friday night. 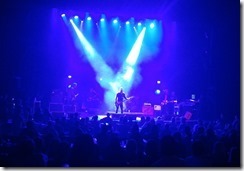 In this context, The Church is the Australian rock band and they were performing at Park West in Lincoln Park, Chicago. It turns out that The Church has had a long career beyond their 1988 "Starfish" album - the CD my brother gave me decades ago that I played repeatedly in the 80s and 90s. "Starfish" was their most popular album, but they were almost a dozen songs into their set before playing the first song from this album - "North South East & West". 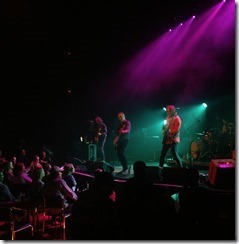 They filled the night with music from the early 1980s (lead singer Steve Kilbey joked that he was 2 years old when he wrote one of the songs) and from their latest album ("Man Woman Life Death Infinity", which was released today). 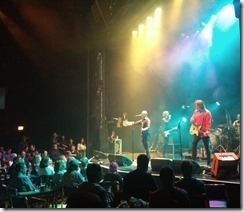 In almost 4 decades, the band has released dozens of albums and they drew on many of them tonight They alternated between straight-ahead post-punk rockers and the ethereal music for which they are most well-known. For me, the high point was hearing "Under the Milky Way". It was like a visit from an old friend and the emotion of the harmonies and acoustic guitar still speak to me after all these years. The following articles walk the user through creating an ASP.NET application; storing source control history in a Visual Studio Team Services project Git repository; and automatically deploying to an Azure web app whenever code changes are pushed to the repository. 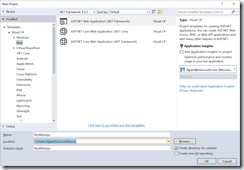 This is Part 2 in a series of articles about integrating VSTS, Azure Web Apps, ASP.NET applications, and Visual Studio. 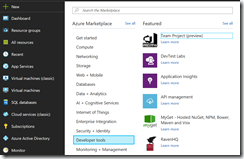 In my last post, I showed you how to create a new Team Account and Team project linked to Azure. 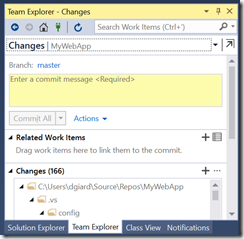 In this article, I will show how to open this new project in Visual Studio, start working with it, and check your code into VSTS Git repository. where xxxx is the name of the account you just created. You can see my account displayed in Fig. 1. Click on the name of your project to display details about it, as shown in Fig. 2. Click the Code link at the top menu. If you have already checked in code, you will see that code in your Version Control Repository. New projects will look like my project, shown in Fig. 3. In Visual Studio, you should see the Team Explorer, as shown in Fig. 4. If you don't see it, you can find it by selecting View | Team Explorer from the menu. Click "Clone this repository" to display the Clone Repository dialog, as shown in Fig. 5. You have the opportunity to change where this new local repository will be saved on your hard drive. Whether you change it or not, you should note the location. Click the [Clone] button. 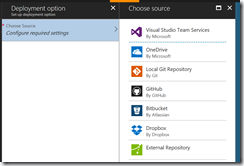 This will initialize a local GIT repository that points to your VSTS Team project. 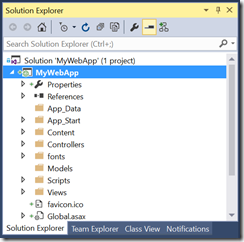 You can now create a new Web App project in Visual Studio. Select File | New | Project from the menu. The "New Project" dialog displays, as shown in Fig. 6. Under the "Templates" tree on the left, expand Visual C#; then select "Web". Select "ASP.NET Web Application" or "ASP.NET Core Web Application" as your template. The location of your project is determined by the combination of the "Location" textbox and the "Solution name" textbox (assuming you have not unchecked "Create new directory for solution"). Verify that this points to the location of the local Git repository that was created above. Uncheck the "Create new Git repository" checkbox. Make any other desired changes and click the [OK] button to create a new button. At the New ASP.NET Application dialog (Fig. 7), click [OK] to create the project. A new project will be created in the repository directory similar to the one shown in the Solution Explorer (View | Solution Explorer) in Fig. 8. 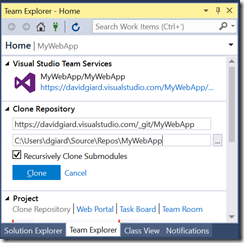 You can check this initial code into your version control repository from the Visual Studio Team Explorer (View | Team Explorer). 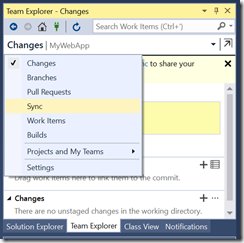 Click the [Changes] button in the Team Explorer to display the Changes panel, as shown in Fig. 9. Enter a comment, such as “Initial commit” and click the [Commit All] button. This will commit your changes to the local Git Repository. 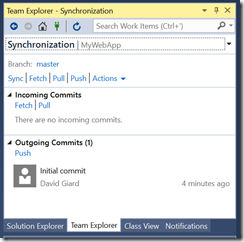 To push your changes up to the VSTS repository, you will need to access the Team Explorer Sync panel. You can navigate to this panel by clicking to dropdown near the top of the Changes panel and selecting “Sync” from the menu displayed, as shown in Fig. 10. The Sync panel displays, as shown in Fig. 11. Successfully synchronized incoming and outgoing commits. If you return to the project code page in VSTS and refresh the web page, you should see all your code checked in. Fig. 12 shows my project after I checked in my initial commit. 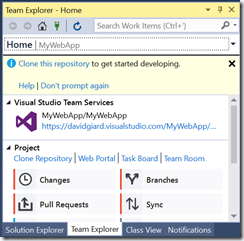 In this article, I showed you how to create a new ASP.NET project in Visual Studio and store the code in an existing Visual Studio Team Systems Git repository. 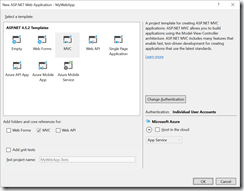 This is Part 1 in a series of articles about integrating VSTS, Azure Web Apps, ASP.NET applications, and Visual Studio. 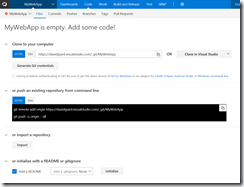 If you want to publish code from your repository to Azure, the easiest way to do this is to create the account from within the Azure portal. Enter a Name to identify this team. Click "Configure required settings" under "Account"; then, click "Create a new account" and enter a name for your VSTS Account (Fig. 4). This name must be unique among all VSTS account, because it will be used in a URL to connect to the account. Click [OK] to close the "New Account" blade. Review all the settings in the New Project dialog. You may wish to change the location, so that it is closer to your team members. (For me, this defaulted to Brazil, so I changed it to Central US). My completed blade is shown in Fig. 5. Click [Create] to begin creating the Team Project. 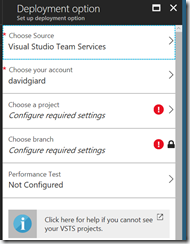 It may take a minute or two to create the VSTS Account and a project within that account. where xxxx is the name of the account you just created. You can see my account displayed in Fig. 6. 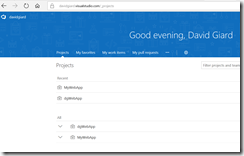 In this article, I showed how to create a team project in VSTS and link it to Azure. In the next article, I will show how to create an ASP.NET application in Visual Studio and push that application’s code into this team project’s code repository.